Two days ago, I read about the extensive mangrove forest restoration efforts at Balaring, Silay. Over the years, the local government, BAMPA, Japanese aid groups (IKAW-AKO), Girl Scouts, and the international chipmaker, AMD, have cleaned up the coast line and the nearby estuaries. 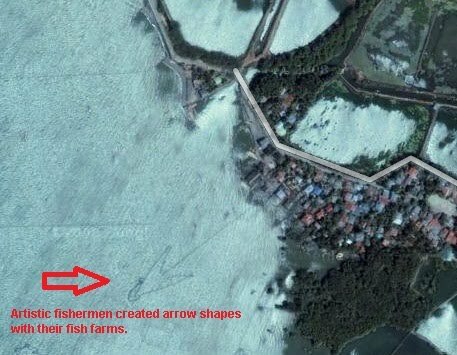 I have been monitoring the shorelines of Bacolod for quite some time and have found them to be depressing, with little wildlife activity and an abundant supply of pollution. The only birds I typically find near the Bacolod shore lines are Euroasian Tree Sparrows that people mistakenly identify as mayas. So I was quite surprised, and excited to read about the restoration efforts at this little township called Balaring. Restoration of Mangroves = Bird Watershed? I was curious whether the restoration efforts increased the amount of bird activity in the area. You see birds can be an instant bellwether of the local environment. The late Roger Tory Peterson, an ornithologist, and one of the founding fathers of the modern environmental movement, once said, "Birds are an ecological litmus paper. Because of their rapid metabolism and wide geographic range, they reflect changes in the environment quickly..."
With the wife's approval, and with little Kaycee's prayers, we set out on a mini-bird expedition as a Sabbath activity. With my Canon 7D packed, and insect repellent, we drove to Balaring and arrived there with just one wrong turn (a record!). From Manila, you fly to Bacolod-Silay airport. You take a right on the main national highway (Rizal St/Lacson), go for a couple of miles until you are at the end of Silay proper. 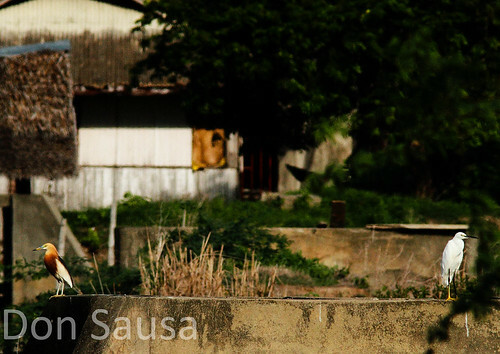 As you are about to exit the city, you will find sugarcane fields and one lone building, the T.L. Jalandoni Provincial Hospital. Take a left immediately after that hospital and follow the road to the coast. From Bacolod, you head north on Lacson St and head north. As you are about to exit the city of Silay, you will find sugarcane fields and one lone building, the T.L. Jalandoni Provincial Hospital. Take a left immediately after that hospital and follow the road to the coast. The coastal area of Balaring is fairly primitive. I want to set your expectations straight, do not expect any three star accommodations here or for that matter, running water and electricity. You can tell most of the industry here is primarily dependent on fishing and aquaculture. There's a few floating restaurants nearby that may interest the adventure loving tourist. I hear they have some of the best seafood in town. And as I looked around, I started seeing some signs of wildlife near the fish farms. 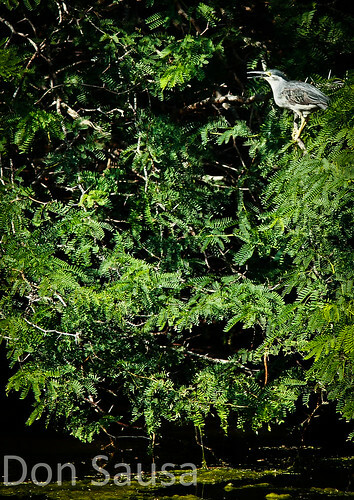 I pulled out the trusty Canon EF 300mm f/4L IS lens and a Canon EF 1.4X II extender to see what kind of birds were in this area and to my surprise, I saw a Striated Heron (Butorides striata)! The first time I've seen them in this region. These birds are known for some unique behaviors such as dropping feathers or leaves on the water so they can attract fish! This is the same kind of bird but at another location near Silay called Talisay. 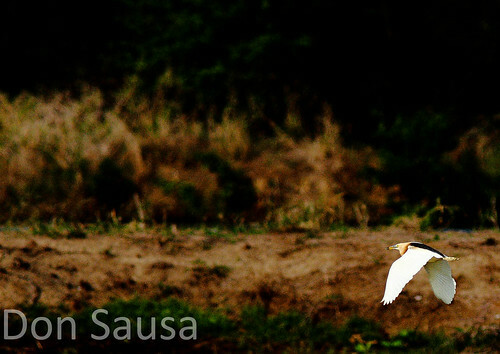 Then after the Striated Heron, I saw a white bird walking about. 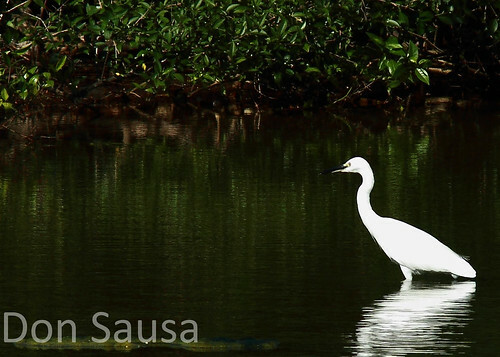 It was a Little Egret (Egretta Garzetta) stalking fish. 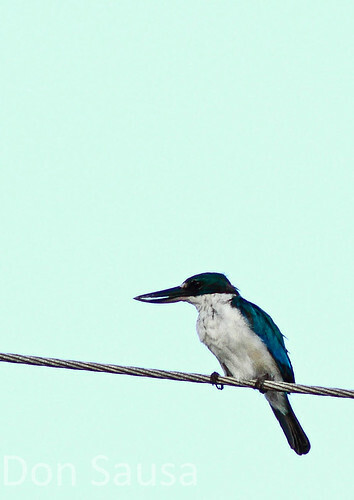 Also saw the White-collared Kingfisher (Todirhampus chloris). 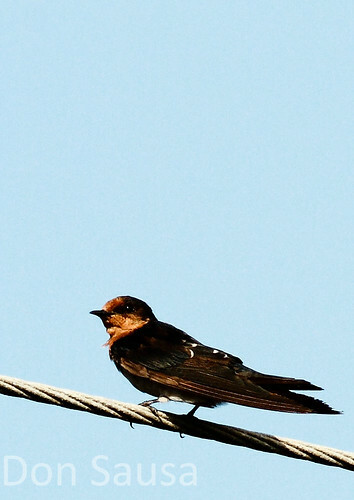 Probably the most common bird I saw aside from the typical sparrows, were the Pacific Swallow or Hill Swallow (Hirundo tahitica). A rare treat that he stopped for a few minutes to let me take a picture. Another large bird I saw was an interesting Javan Pond Heron (Ardeola speciosa). It has breeding plumage, so it must be mating season. Look carefully and you will find two of them in the picture. And what's a bird tour in the Philippines without at least one picture of the Philippine maya, the national bird of the Philippines up until 1995. 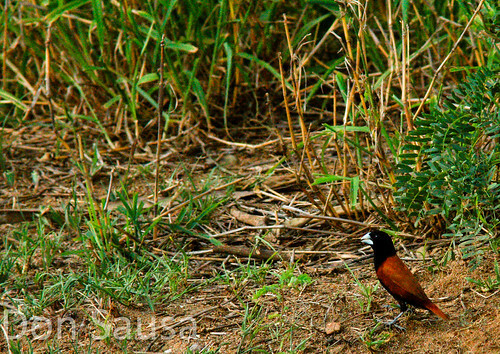 The Black-headed Munia also known as Chestnut Munia (Lonchura atricapilla) is an estrildid finch found throughout Asia. The subspecies that's endemic to the Philippines is called Lonchura atricapilla jagori. 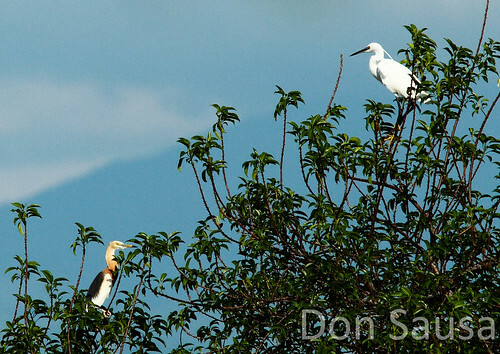 Here's a couple of pictures of a face off between the Javan Pond Heron (Ardeola speciosa) and the Little Egret (Egretta Garzetta) and one Javan Pond Heron flying off. Looks like the habitat restoration is paying off, with migratory birds and non-migratory birds taking advantage of the new ecosystem developing around the newly expanded mangrove forest. 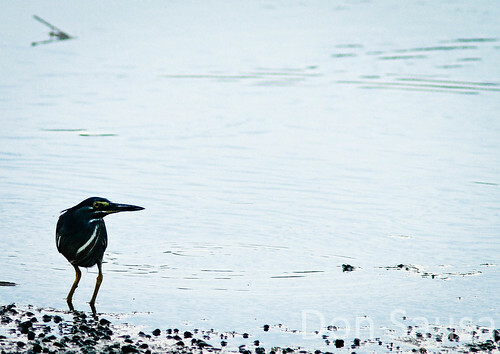 In time, you will see the supply of fish increase as these estuaries mature and more birds will come to the area. 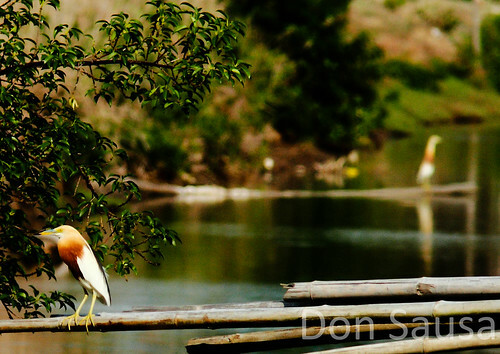 From an economic standpoint, Silay could take advantage of this and further expand this area, not only ensuring that the fishing villages have ample stocks of fish through the habitat restoration, but to also expand the current ecotourism attractions from the current mangrove forests tours to guided bird tours that employ the local population. Add solar powered lights for night use, pave the dirt road, put in a weekly garbage collection route, add some picnic tables, and this place could be an awesome weekend distraction even for the locals. Very interesting facts and pictures of the area. I landed on your blog while searching for aquaponics. This is a very informative post. I have a blog also mostly promoting Negros Occidental. I hope a lot of people will be aware of the benefits of protecting and conserving nature. Would it be ok if I repost this? Watermarks and links will be retained. Thanks! Sure. Please link to the original post though so the search engine will follow, thanks! I enjoyed your write-up on Balaring. I have been here myself and it is surreal and beautiful. Come over again! Hong Kong's "A Symphony of Lights"